Customer service plays a huge role in growing your business and building your brand. According to a RightNow report, 55% of those surveyed became customers of a company because of their reputation for customer service. Great service attracts new business, and helps you not only keep existing customers, but build loyalty amongst your customers. The reason is because it is through customer service that you can make customers feel that they are not just an order number for your business. A great customer interaction and complaint-resolution tells them that you care more than just making money. In a previous post, we’ve talked about three ways to level up your customer service. Here are five tips to help you build stronger customer service for your business. One of the first things to think about when you build your customer service strategy is to think of goals you want to achieve. Depending on your business and your strategy, these can be providing responses within a certain time, providing resolutions within a certain time, retaining a set percentage of customers, threshold on the number of refunds you have to provide, etc. 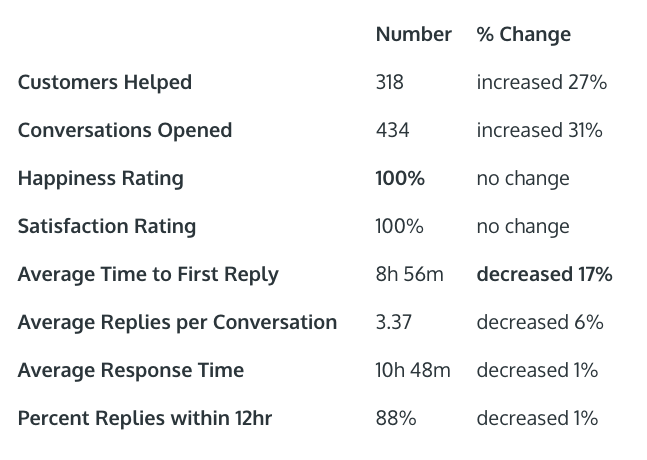 Below is our January Happiness Report where we list out our customer service stats. You can build similar reports and focus on specific goals within those reports at different times. For example, you can work on decreasing the response time for your service team by creating templates for parts of emails that don’t change, or by figuring out a better way to assign service tickets amongst the team. You can use platforms like Help Scout or Front to manage and assign emails. Once you achieve one goal or one aspect of a goal, you can then move on to improve other aspects or set new goals. Each month in our Happiness Report, we include a “Goals” section for what the focus will be for the coming month(s). There are some goals that you can measure internally, like response time or replies per conversation, etc. There are other goals that you can only get feedback about from your customers. For such goals, create a simple survey to gather input on that metric. Long surveys take time away from a customer and may create a negative experience. Try to keep the survey length so that they can be completed within a few minutes. Better yet, you can embed a simple rating system in your email requesting feedback, and then direct customers to a complete (still short) survey if they feel like providing more responses. 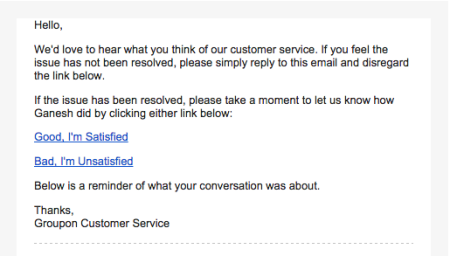 In the above Groupon example, it is very easy for customers to click on one of the links to submit a response. Only people who have time or are interested will choose to complete the full survey. In this way, you get to build feedback on at least one question. Feedback emails, especially if they are signed by the owner/founder, also signal to customers that you’re interested in improving your customer service based on their feedback. This shows that you care about them and the interaction enough to at least gather their response. Even when you only have a small team (or just yourself) to address customer concerns, it is important to set out some guiding principles, style guides, and procedures. 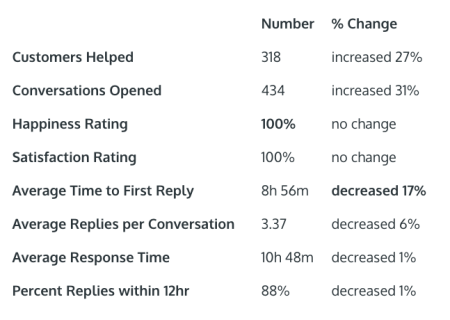 This not only helps the team focus on why they are providing the customer service, but also create consistent experiences for customers regardless of which team member replies. Help Scout has a useful article about Ritz-Carlton’s support values, guiding principle and motto. Their motto – “We are Ladies and Gentlemen serving Ladies and Gentlemen” – is simple and concise, and sets the tone for how they see their customers and how they’re being served. Similarly, you can develop a guiding principle for your own team. You can also create style and tone guides that set the foundation of the language used during customer service. Depending on your business and target demographic, the style and tone of your responses can be formal or casual – for example, should the greeting be “Dear John”, or “Hey John!”. However your tone guide is structured, try to keep the language positive, empathetic, and one that is striving towards a resolution. Customers don’t ask for support to hear your list of excuses. So make sure that that’s not what they get. Instead, try to understand why there is a gap between their expectations and what they received. That gap is almost always the reason behind angry or unhappy customers. Since customers can rarely test or try out products purchased online, they’re taking a leap of faith that your business will deliver what they’re expecting. Sometimes, your product may not reach up to these expectations. In such cases, customers may demand a full refund of their order. Create a refund policy that is clearly stated on your store. This will help customers understand when they can or cannot get a refund, and how long after their purchase they can receive the refund. Sometimes customers may demand a refund even if they don’t qualify within the policy. In such cases, it is important to set procedures for your customer service team for how to deal with such cases, and whether or not they can provide refunds outside of the policy. If you know something was wrong with your product, even if it is outside of the refund policy, offer a full refund to customers. It can turn a bad experience into a good one. It also suggests that you run your business fairly. This honesty can turn many unhappy customers into advocates for your brand. An alternative to providing a refund is to give a discount or a store credit on a future purchase. For those who don’t qualify for a refund within the policy, this can be good way to retain them as customers, while making sure you don’t end up losing revenue on refunds. Discounts and store credits also make sure that your customers don’t switch to competitors. Many companies assign quotas for how many promotions or credits a customer service representative can give out for an individual customer. This can help manage the expense related to such discounts. Great customer service should be an integral part of your business and growth strategy. As your business grows and your products become more complex, so will your customer base and the attention that those customers will need. Even though the core component of your business is to sell products, building a customer service strategy should always be on your radar as it can help accelerate your growth and differentiate your from competitors. As you grow, you’ll need to hire staff to handle customer issues. With some basic guidelines and procedures in place, you can make sure that on-boarding is an easier process, and that customers get a consistent experience while dealing with different staff on your team. On-boarding is easier to do over email before your staff can move to more “immediate” channels like live chat or phone support. On such channels, inexperienced staff can create a negative impact on customer experience as issues may not be resolved in a timely manner. What else can store owners do to improve customer service? Share your learnings in the comments below.